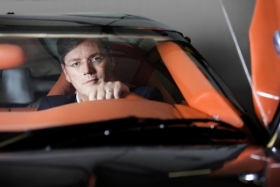 Spyker CEO Muller says Spyker-Saab will be profitable by 2012. Two months ago it looked like Saab was finished. At the time, parent General Motors Co. said it would close the money-losing Swedish brand because a sale to Dutch niche car maker Spyker Cars NV could not be completed quickly enough. Saab's chances of survival appear better than ever after two key events last Friday. The European Investment Bank (EIB) approved a 400 million euro ($547 million) loan to Saab, which is a crucial part of Spyker's deal to take control of Saab from GM. “This was a crucial component in enabling the acquisition of Saab to proceed. Months of hard work have paid off. We cannot wait to close this transaction now as soon as practically possible,” Spyker CEO Victor Muller said in a statement. Said Saab CEO Jan Ake Jonsson: "This represents another milestone along the path toward the creation of an independent Saab. This is very good news and everyone at Saab should feel very positive now." The approval came hours after Spyker shareholders met in the Netherlands to approve the deal with GM. During the meeting Muller said that if the deal is completed the combined carmakers will seek to list its shares in London and Stockholm and leave the Amsterdam stock exchange. "With this acquisition, we have a very rare opportunity to buy into an iconic brand," said Muller, a former mergers and acquisitions lawyer and fashion brand executive who revived the defunct Spyker brand as a luxury automaker a decade ago. Asked whether any new listings would make it easier to raise cash from investors, Muller said the goal was "to be closer to investors." Despite high hopes, Europe's public offerings have met with tepid investor interest this year, with deals attracting funding below target or shelved altogether. “He's (Muller) is going to have to prove what Spyker can do with the business," said Ian Fletcher, analyst at IHS Global Insight. GM agreed late last month to sell the struggling 60-year-old Saab brand as it rebuilds its business, and struck a deal with Spyker two weeks ago after intense negotiations and two failed bids. Spyker is paying GM $74 million in cash and $326 million in redeemable preference shares for Saab. The deal was contingent on Saab getting the EIB loan. Muller has already secured the $50 million needed to close the deal with GM, with the remaining $24 million due in July. He also vowed that the new group will reach profitability in 2012, although neither Saab or Spyker have made any money in the past decade. With the loan, Saab's $200 million in cash and the redeemable shares, Muller said Saab would have enough to fund its business plan. The brand's revival is centered on a new 9-5 that launches this year, the arrival of the 9-4X crossover in 2011 and the debut of a new 9-3 in 2012. Saab produced just 20,791 cars last year as sales slumped to 39,903 from 94,751 in 2008, but aims to raise production to pre-crisis levels of about 100,000 to 125,000 within two years with the help of the new models and a new sales and distribution strategy.